As I write this, only a few hours have passed since a jury of six women found George Zimmerman not guilty of the murder of Trayvon Martin. Many of us who followed the case from the very beginning thought at the very least Zimmerman would do time for manslaughter. However, the jury of six, felt that under Florida's stand your ground law, Zimmerman used deadly force properly to defend himself. As someone who was a co-sponsor of Mississippi's version of the Castle Doctrine, I strongly disagree. If Trayvon Martin had followed George Zimmerman to his vehicle, attacked him and viciously beat him, then the Castle Doctrine could have been applied two ways. First, if Zimmerman saw him approaching, he could have defended himself by any means necessary, before any attack, on the presumption that his life was in danger. Second, if he was viciously attacked, he could have defended himself by any means necessary to stop that attack. That was not the case on that fateful night of February 26, 2012. Zimmerman was the aggressor and as Trayvon was defending himself, Trayvon was shot and killed. Call it racial profiling. Call it injustice. Call it whatever you want. In the end, a 17-year-old was gunned down in Sanford, Florida and the shooter was exonerated. All I could think about was my 11-year-old son in the next room, oblivious to the events transpiring, watching his favorite television shows on the Cartoon Network. How would I have reacted if that was my son gunned down? How am I going to explain to him why this happened? How can I, with the best of my ability, make sure that this does not happen to him when he is 17? I may sound racially insensitive when I say this, but here it goes: it is a challenge to safely raise an African-American male child. Case in point, when I was a junior in high school, I came home down Morgan Street. On the corner of 81st and Morgan, a Chicago Police Department squad car was parked, blue lights flashing. In front of the car were two police officers, gunned down. What took place next was the most massive manhunt in the history of the city. During that two-week stretch, every young black male was a suspect. Every traffic stop had multiple cars responding. African-American parents were constantly keeping track of their male children. All of us were on high alert and didn't travel alone. When the suspects were apprehended, the African-American community, sans the immediate family of the perpetrators, breathed a collective sigh of relief. It was then that I saw racial profiling first hand. It was not comfortable then, and despite this verdict, it is not comfortable now. I saw the stress my parents tried to cover up. Now, it seems, it is my turn to stress. What is to stop someone from mistaking my son to be a potential criminal, especially someone who has the grand notion of being in law enforcement some day? As of today, the justice system that is suppose to bring balance to the society and sense to the laws of this land failed in the Seminole County Courthouse. Many will blame the majority white jurors, the prosecutors who brought forth the case, and according to one Twitter account, even the President of the United States. I will put the blame solely on George Zimmerman, because the injustice happened even before the trigger was pulled on his Kel-Tec 9mm. Zimmerman, in his zeal to be a relevant protector of his community, failed to use the discernment that is God-given and the proper judgement to back away until the real members of the Sanford Police Department arrived. He automatically assumed that this young African-American male named Trayvon Martin was a criminal linked to several break-ins in the area, based solely on his appearance and his teenaged meandering. Bottom line, he was Black so he was up to no-good. All of us Black men have had the purse switch experience. All of us have been profiled. It is part of our experience in this society. However, it still does not make it acceptable, even if you are found not guilty of killing someone because of it. Listening to George Zimmerman's brother, Robert, after the verdict, it is painfully apparent that this practice runs deep, that it will take at least several generations to be purged and that the post-racial America people lauded after the election of President Obama has clearly not arrived. For those who want to say that the system worked, I make the contention that the process worked. The case was presented, both sides made their arguments and the jury reached a verdict. But this system is a justice system and justice was not enacted on July 13, 2013. 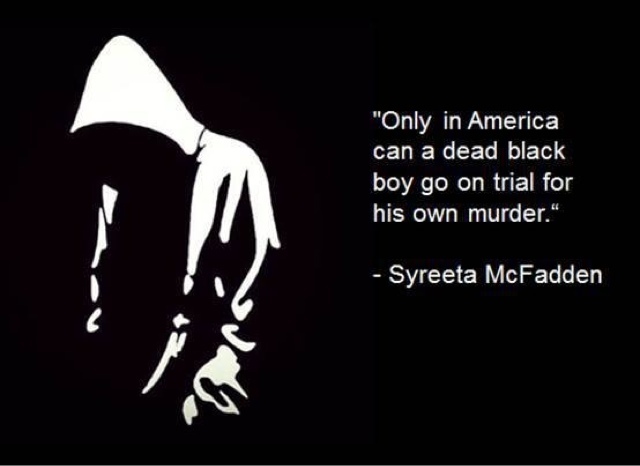 The death of Trayvon Martin was an unnecessary tragedy. However, the history of this country has shown that out of tragedy comes triumph. I pray that tradition continues and the justice many sought in the courtroom will find its place in the hearts and homes of the citizens of this nation. America, the country we choose to live in and constantly seek to perfect, needed a wake up call. This is it.